So far, nothing has managed to unseat Get Out as my favorite film of the year. But Gook, the new movie written and directed by Twilight actor Justin Chon, is definitely a close second. 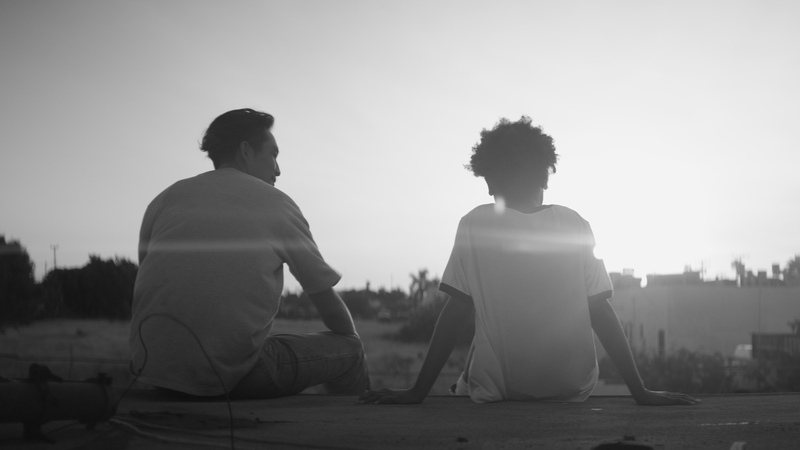 Shot in black and white, Gook takes place in and around a Paramount, California, shoe store run by two Korean brothers, Eli (Chon) and Daniel (David So). Eli and Daniel have, in a sense, adopted an 11-year-old black girl named Kamilla (played with stunning control and depth by Simone Baker). Kamilla’s mother is dead, and she lives with her older sister and brother and works in the store with Eli and Daniel. The movie follows the characters on the day the verdict in the Rodney King police brutality case is announced. Chon, 36, grew up in Irvine, California, and often worked in his father’s shoe store in Paramount. His father, Sang, a Korean immigrant, was a child actor in South Korea, and in Gook he plays Mr. Kim, the owner of a liquor store. Chon was heavily influenced by La Haine, a 1995 film that examines the aftermath of riots in the projects of Paris when an unarmed Arab man is shot and killed by French police. Gook’s distributor recently decided to extend its theater run, so if you haven’t seen it yet, you still have a chance. How did La Haine influence your thinking about Gook? I really loved the ’90s era of filmmaking where if you could get access to a camera, it had that sort of Clerks way of making films where it was all much cheaper. [La Haine] was about three friends who were from different ethnic backgrounds, and that just represented when I was hanging out at my dad’s store and would make neighborhood friends. I met this French guy, we were talking about film and he was like, ‘Have you ever watched La Haine?’ When you think of Paris or France, you just think of the tourist aspects and how they enjoy life and how their food is so amazing. And he’s like, ‘You know, you should watch it because it’ll change your kind of a perspective of like what else exists there.’ When I finally saw it, I’m like, ‘Wow, this is exactly like what happened here.’ Same s—, different place. I’m thinking these are American problems. But then I look at them and I identified so much with them being youthful and diverse and into things like break dancing. When I started thinking about [Gook], I just started thinking about all the social dynamics, and that film just kept popping up in my head. There’s so many similarities. It just never left my psyche. My film constantly gets compared to Do the Right Thing, and I understand that. I was a huge fan of Spike Lee growing up, and that’s just in my blood now because I’ve seen his movies so many times, but it wasn’t exactly the main influence. Here’s the thing: I knew, no matter what, I was going to get that comparison just because of how bootstrap the film was and how minimalistic it was and the type of humor that I’m into. I mean, Kevin Smith isn’t exactly my god or anything. I don’t look at his work and say, ‘You know, that’s like the end-all, be-all’ — not even close. Let’s be honest. I really love what he’s done, but, like, I just knew I was going to get that comparison because of the single location, these guys hanging out over the course of a day. So I was just like, if they’re going to make that comparison, I’ll just give them a little nugget, a little Easter egg. It’s like, yeah, I know what you’re going to think. Even Mr. Kim, the first time you see him, I paint him as the exact thing you’ve seen in every movie like Menace II Society. This is what you are expecting from an L.A. riots film in ’92, right? I felt like my job as a filmmaker was to slowly peel the layers away and humanize them. You present a full picture of the tensions that exist for Koreans in Southern California, not just with black people but with Latinos. Those attitudes vary a lot depending on generation. Especially in modern cinema, there’s a fear of offending anyone. I’m totally with that — let’s respect people. I just didn’t want to shy away from everything. If I’m going to talk about this event, this uprising, I felt like it would be detrimental for me to candy-coat anything. At the time, blacks and Koreans were not getting along. But nobody was getting along. It’s always seen as a black and white issue, but then because I’m Korean, it becomes a Korean and black issue. What do I remember? It wasn’t like it was just a black and Korean issue either. It was everybody in this community just trying to make things work. Within the Korean people I showed — we don’t get along, either! Intergenerationally, we have huge problems because they come from the old country and we all were born here. We have a different set of morality and ethics than they do. We’re Americans. I felt like I can be very nuanced about it, but in the early ’90s there was nothing nuanced. Everything was much more in your face in terms of, like, music, like, N.W.A. — there was nothing muted about that. So I just felt, if I’m going to talk about the riots, this film really needs to be raw rather than me trying to idealize anything. 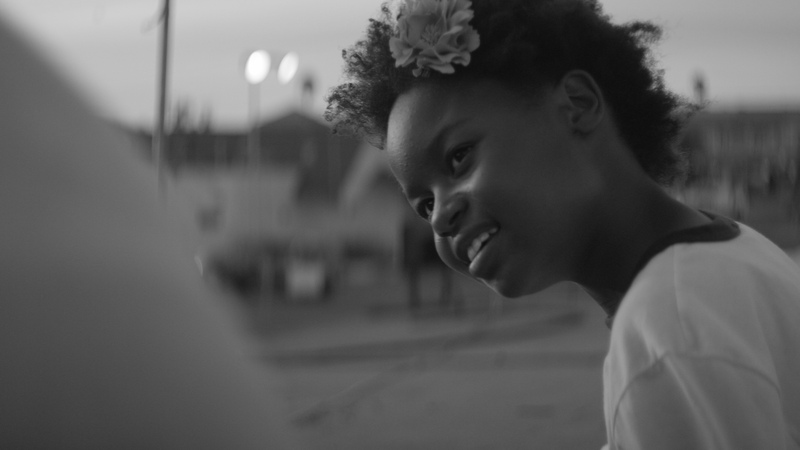 Simone Baker as Kamilla in Gook. It’s astonishing that you have a black girl at the center of a film whose name is an Asian slur. What made you want to tell this story through her eyes? One of the main reasons was that if I’m going to make a film outside the system, I want to represent some of the most underrepresented demographics, which to me are Asian-American men and African-American females. Defend yourself. Don’t let anyone take advantage of you. All those things, a false sense of protection and ego and all that stuff. But because of that I was like, man, you know, I just need some balance. And I knew that character was going to be the bridge between these two communities. There was a point in the rewrite I figured if I make her a little girl — you just treat little girls differently if you’re a man. You’re not going to be so rough with them. I realized quickly that [Daniel and Eli] would be more of themselves. They would let their guards down. They would treat her with more respect and more gently than they would with a boy. She’s so resilient and so positive, I just thought it was refreshing to see a girl like that. It makes the end that much more gutting. With Keith [Kamilla’s brother, played by Curtiss Cook Jr.], how he interacts with her — I don’t think he could ever hit her. I knew when she asked, ‘Tell me something good about Mom,’ if it was a boy, being an older brother, he could be like, ‘Just toughen up. It’s all good.’ But with a girl, you’re kind of forced to deal with it at some level. Justin Chon (left) as Eli and Simone Baker as Kamilla in Gook. You use her to draw out everyone’s emotions, like when Daniel and Eli are dancing in the store with her. The two of them are so protective of her, and it’s sweet. Especially when Mr. Kim comes and slaps her. It’s just like, you can’t let that happen! Who’s going to think that’s OK? That’s an important moment because the audience — you’re going to decide right there. What is this going to be like? What kind of relationship is this? How do these communities come together and what is this all about? As soon as you see these brothers stick up for her, it’s like, yes, they’re doing what should be done. It doesn’t matter whether they want her to be at the store or not. The point is that should not happen and these two brothers need to be there for her and stick up for her rights as a human being. Everyone in this film is complicated, and you don’t see the filmmaker’s ego. The reason I’m an actor, the reason I’m interested in directing and writing, is all because of collaboration. I really believe in a group coming together. You can’t make a film by yourself. It’s impossible. I mean, you can, but it will take a long time and it probably won’t be interesting. We’re talking about human beings. It’s such a complicated thing, and there’s so many things that make it so beautiful and unique. Ego, in singularity, in terms of storytelling — it doesn’t serve our collective human experience. The first thing I said was Eli and Keith are the same character. They both are orphaned. They both are trying to take care of younger siblings, both trying to make ends meet and struggling to make that happen. It’s just that they can’t see eye to eye and realize that they share some of the same pain. Curtis was like, ‘OK, that’s fine. But you have to understand that everything I do as an African-American male, I’m representing. I just want to make sure that this is done correctly.’ So we had hours and hours and hours of conversations. I wanted him to know I was going to make his character three-dimensional. He wasn’t going to be an angry black man. 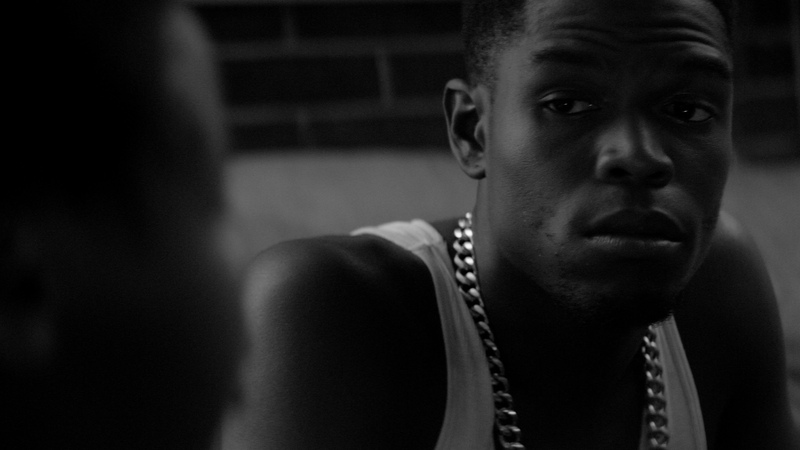 Curtiss Cook Jr. as Keith in Gook. I’m familiar with Cook from Naz & Maalik. That’s why I hired him — I saw the movie. He’s so good in that. He’s just so honest, so present. He’s dynamic. When you watch and you’re like, ‘OK, here’s a human just being a human.’ This guy, even if he’s aggressive in this film, he can bring the humanity and sensitivity that I needed. What do you remember about Latasha Harlins, the 15-year-old girl who was shot and killed in 1991 by a Korean shop owner who suspected her of stealing? What were the discussions of that like with your parents, within your community? It’s a very delicate thing to talk about. That’s the thing about authenticity. In my film, people ask me, ‘What kind of research did you do to accurately represent the African-American experience?’ It’s the same thing with Latasha Harlins and how we talk about this. I can only tell the story from my perspective and my experiences because I will never understand what it feels like to actually be African-American in this country. That whole incident was unfortunate and it was not right. The fact that [the shop owner, Soon Ja Du] didn’t do any jail time, that’s — that’s f—ing crazy. So in terms of the rage, that’s just understood. That’s a given. People feel like justice was not served, and rightfully so.